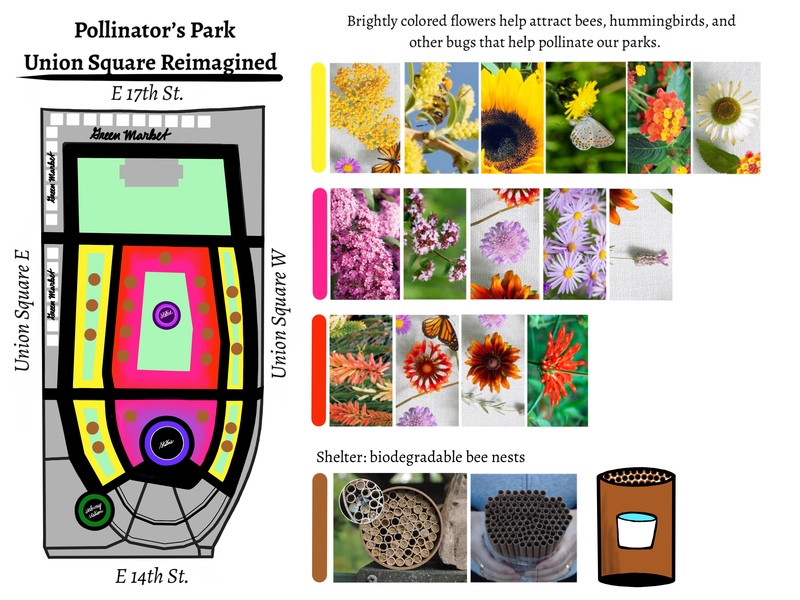 I decided to redesign Union Square from the perspective of pollinators (bees, birds, and other insects in particular. I incorporated a color coded flower planting map for a vivid, and beautiful landscape design which is optimal for attracting the most pollinators. The brightness of the pink/red flowers will draw pollinators to the center of the park first in order to keep them in the park for longer, the more subtle colors are located around the edges of the park where the pathways are so there is less contact between the people enjoying the park and the insects and birds that live there. I also added shelters for masonry bees which is a solitary type of bee who’s sole purpose is pollination, they do not have a queen, and do not produce honey or beeswax, but during Spring shelters help protect them from the cold weather. Each Shelter also has a small water collection for rainwater.